Customisable furniture, recycled things and out-of-the-box material combinations, were part of the eclectic display at RAW Collaborative’s exhibition. 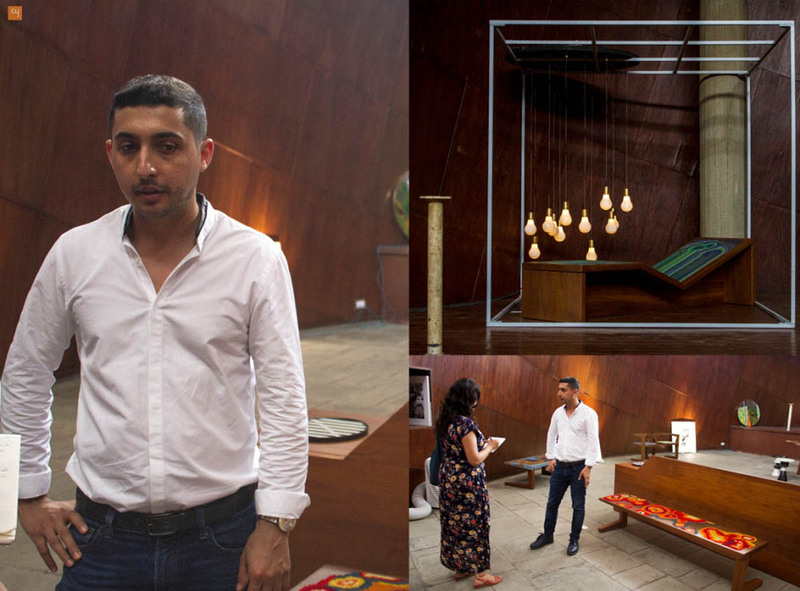 On September 9th, against the backdrop of Le Corbusier’s masterpiece, the ATMA house, was laid out a true feast for the eyes – the finest and most revolutionary collection of Indian furniture designs. Bringing together a range of explorations in materials and craftsmanship, RAW Collaborative’s exhibition focused on interiors and the furnishing of the built form. 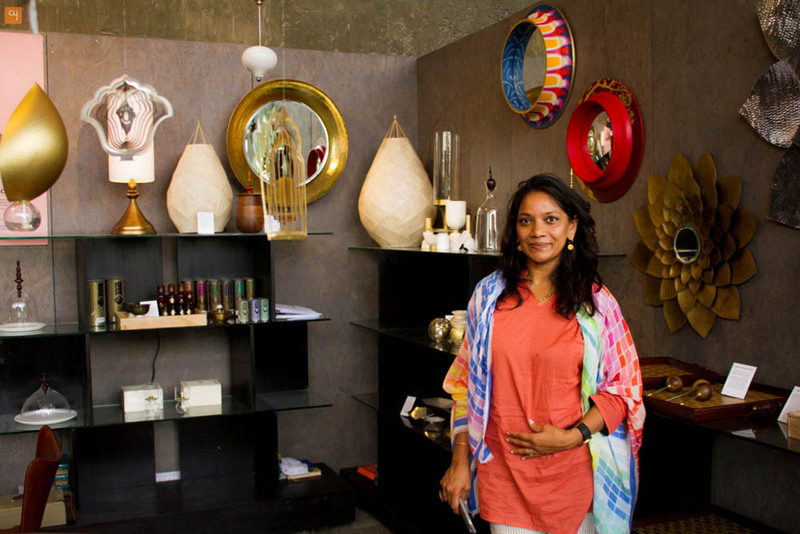 An enthralling celebration of India through design, it showcased outdoor furniture, indoor furniture, public furniture, soft furnishings and lifestyle accessories. The exhibition was conceptualized by Development 2020 and presented by The W-Trunk. Highly acclaimed designers Rooshad Shroff from Mumbai and Sandeep Sangaru from Bangalore were special invitees to the event. Shroff presented his celebrated collection 15556, which contains some unique combinations of materials – embroidery on wood, marble carvings and colour sanded lacquer on wood. 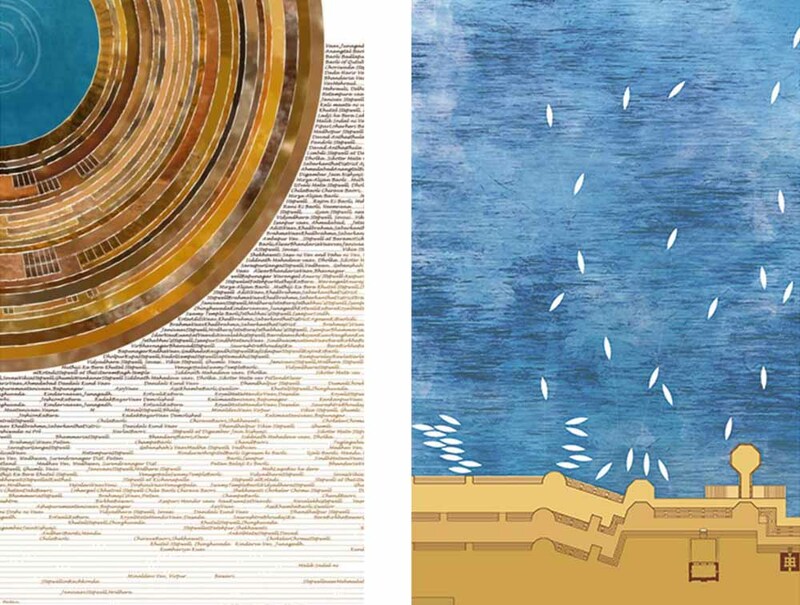 By working with a diverse range of materials like wood combined with prints, concrete and metal, Chennai’s ‘Wood Inc.’ allows the viewer’s imagination free rein to visualise the many techniques by which these can be combined. ‘Workhorse Furniture Pvt. 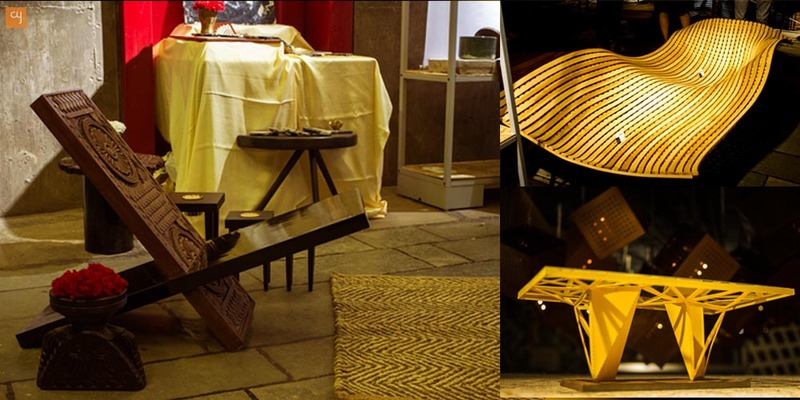 Ltd.’, with studios in Hyderabad and Ahmedabad, also works with materials like concrete inlaid with brass and wood, and burned wood. They play with levels, textures and our perceptions of these. 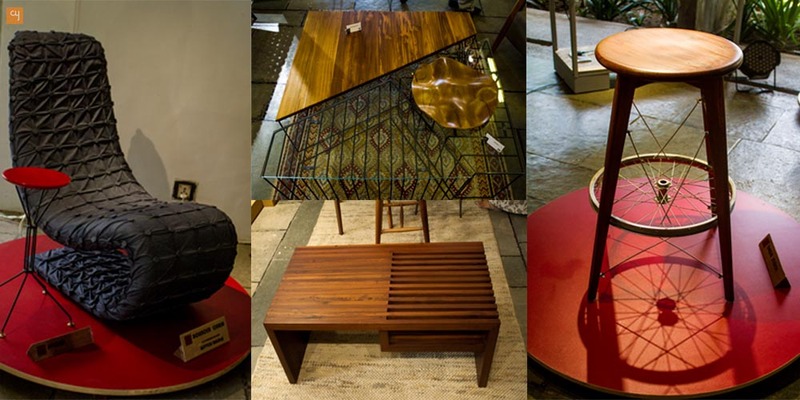 ‘Knock on Wood’, Delhi also celebrates the beauty of wood. 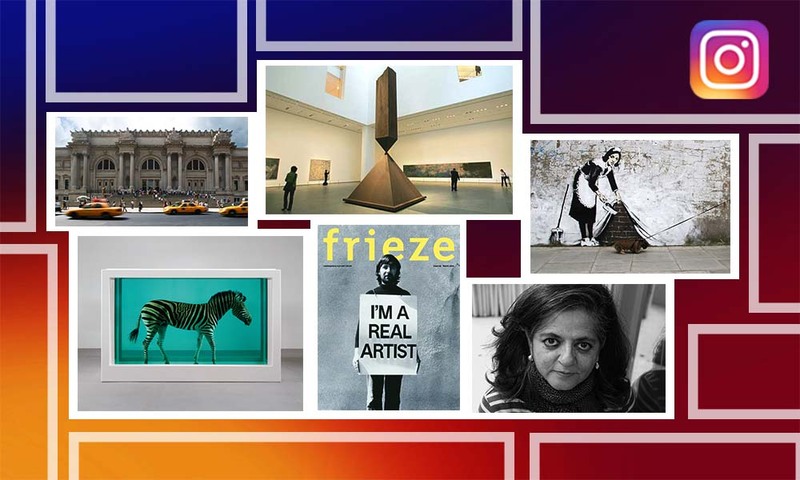 Looking closely at materials and their behaviour is, similarly, the studio ‘Rhizome’ in Ahmedabad. Their collection employs bamboo as the key material, in combination with others. 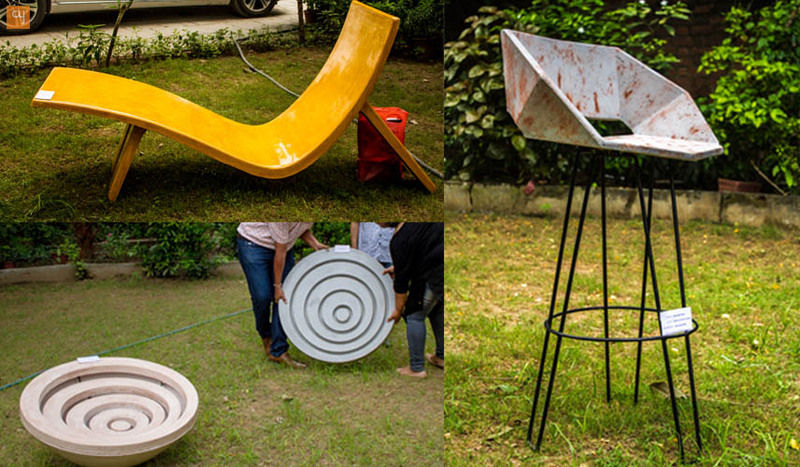 A collection of outdoor and street furniture using concrete was brought forth by Ahmedabad’s ‘Baakas Design’. The collection is called as Otlo, after the eponymous Gujarati residential element. Noida’s ‘GOMAADS’, on the other hand, experiments with the use of concrete as part of interiors. They are inspired by products of daily utility and have produced many of these using concrete. 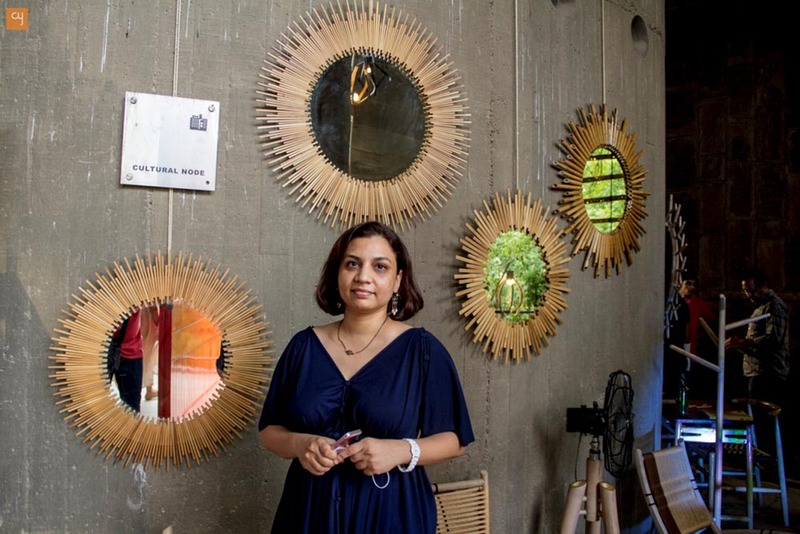 Rethinking the purpose of design are duos like the sisters Nikita and Nitisha Popat of ‘N Square Studio’, Hyderabad, who believe in making design accessible for everyone, by creating affordable and limited edition products. Reclaiming and recycling were also observable as inspiring approaches to furniture design. 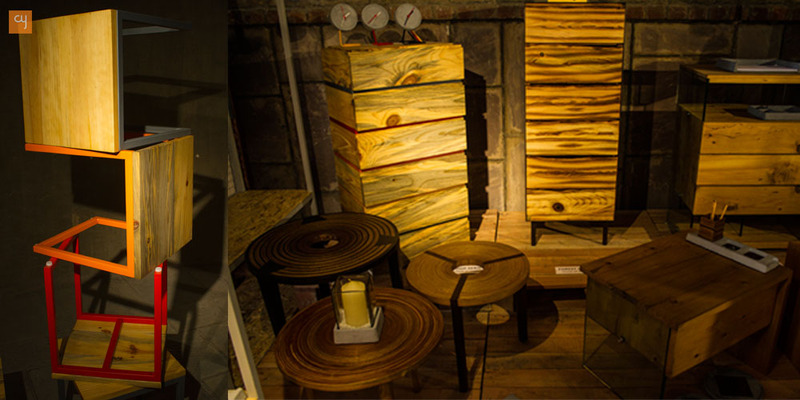 Many of the indoor collections of ‘CASSA Group’, Ahmedabad, are made using reclaimed furniture. ‘Artemis Designs’ uses recycled stone dust to create products that serve as facades and landscaping elements. While many of the works are focussed on an Indian expression, those of ‘Anantaya Decor & AKFD Studio’ of Jaipur and ‘Design Clinic India’, Delhi, stand out in particular in this regard. While incorporating the wisdom of different crafts techniques in their products, the former have worked with crafts people like the Thateras and miniature artists. ‘Design Clinic India’s two collections Phool Mandi and Safa take their inspiration from local scenarios. ‘Pomegranate Fabrics’, Bangalore, works directly with weavers, dyers and printers to produce its designs. 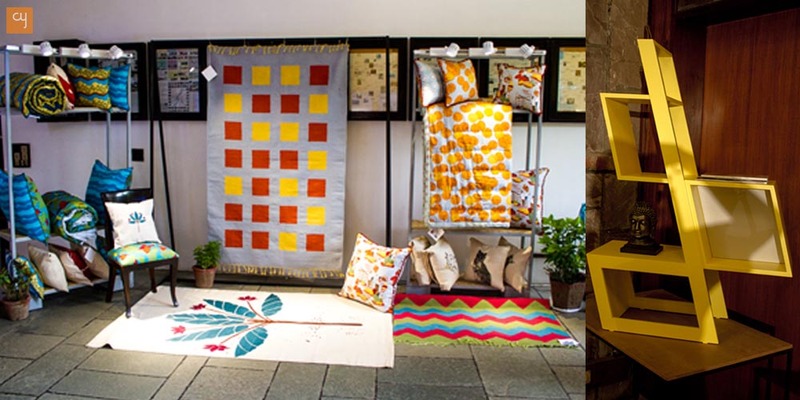 They brought to the exhibition a collection of soft furnishings that had been hand crafted in Tamil Nadu and Bangalore. Nehal Desai’s works are, likewise, beautifully handcrafted and painted. Making furniture customisable was also an evident exploration among the many designers. One of the designs in the exhibition which caught the eye was a bench designed in the form of a wave using bent wood, by Ahmedabad’s ‘Studio Andblack’. ‘ERP Design Studio’ and ‘Pocho Living’ of Ahmedabad also strive to fit their furniture to user needs. Aiming to create lasting bonds between furniture and the individuals using them, self-trained designer brothers Anand and Anuj Amabalal of ‘A Cube Inc.’ in Ahmedabad, presented their highly personalized conceptual furniture. They also collaborated with textile brand ‘Button Masala’ for one of the furniture pieces on display. 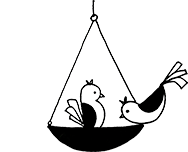 ‘Waylin Furniture’ of Ahmedabad, likewise, innovates by making dynamic and interactive furniture that questions conventional furniture styles, and draws inspiration from the seasons. A range of modular furniture systems influenced by the form and structure of beads and threads was, furthermore, displayed by Ahmedabad’s ‘The Shed’ in their collection Bead/Thread. In this, they also incorporated elements from board games, which lent the works a playful, yet utilitarian, feel. 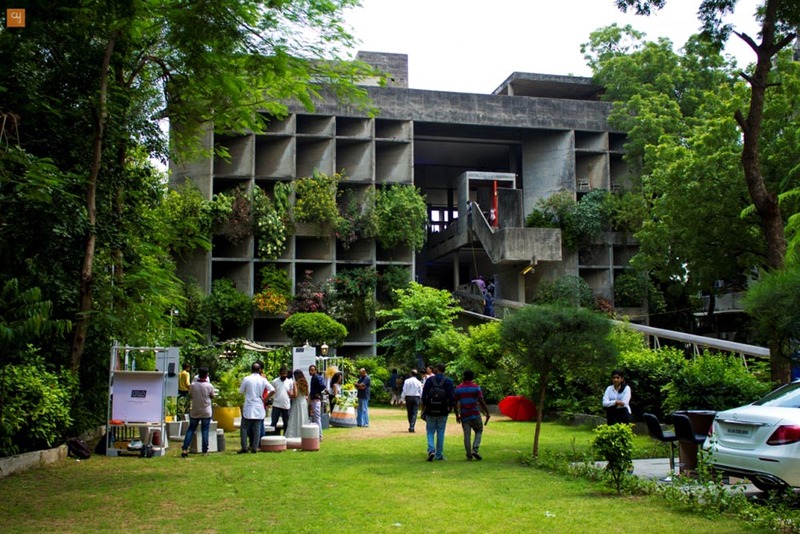 The space of ATMA house was a big draw for all the designers on the day of the exhibition, all of whom were enthused to showcase their works in such an iconic space. It was intriguing to see such a large turnout at a niche event. 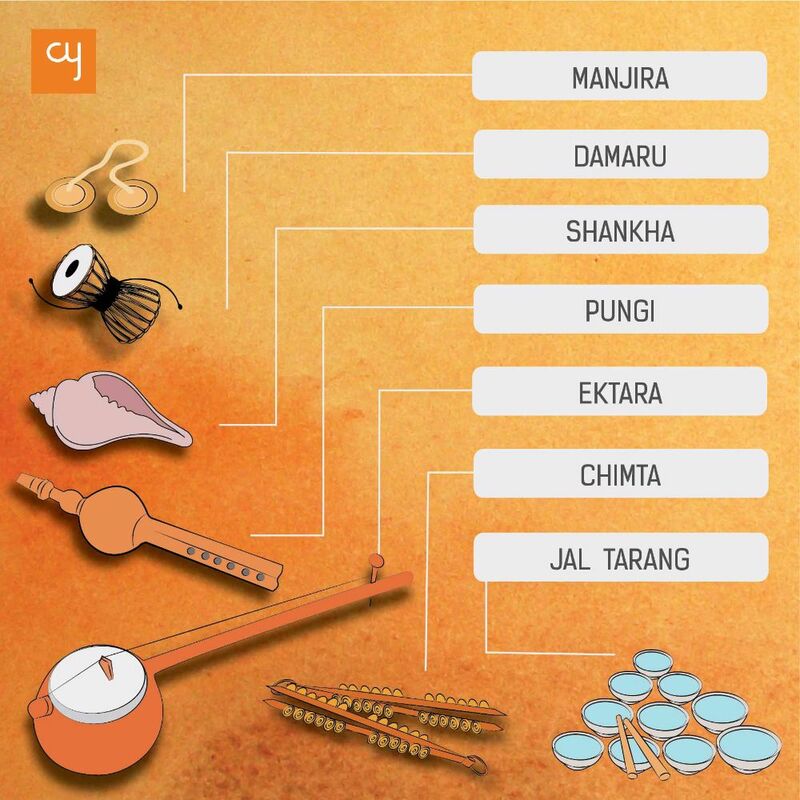 It goes to show the Ahmedabadi’s love of all things artistic and design-oriented.